Security and privacy certifications have been identified as one of the most effective means to increase the level of trust in cloud services and stimulate their adoption. Based on this assumption, it was critical to focus on the appropriate standards and their interoperability. Therefore, a number of efforts have started in Europe, mainly led by the European Commission, in collaboration with ENISA and the Cloud Standards Coordination ETSI effort, as well as in the USA and other regions of the world. 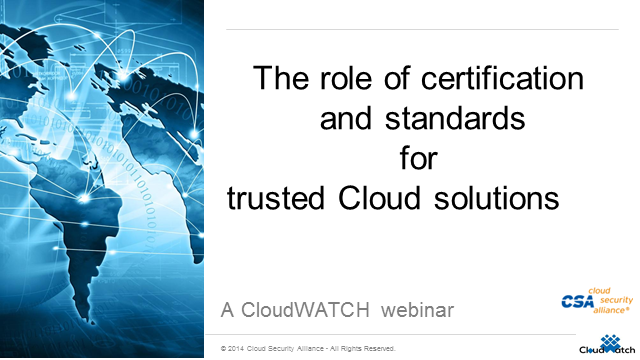 In this webinar the panellists will discuss the role that security certification and standards can play in supporting a more mature and pragmatic approach to cloud computing. On 2 October you will have the opportunity to ask questions in this interactive webinar.